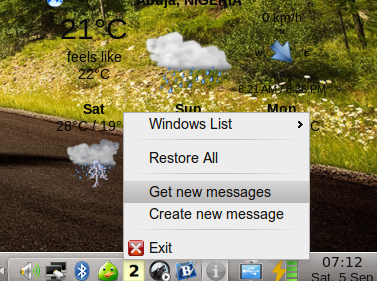 One of the first set of things i do when i install a fresh Ubuntu performance tweaks changes the default email client. Both evolution (ubuntu) and kmail (kubuntu) don’t just cut it for me, they always seem bloated and buggy. I am a KISS guy -not that kiss (fine am that kiss too but the kiss i refer here is the Keep It Simple Stupid kind of kiss ) hence i find thunderbird to be the email client that just suits my needs. It doesn’t try to take over the world or make dinner for me. Its first and foremost an email client and its keeps with the Unix philosophy of do one thing and do it well. However one thing i have always wish it had was the ability to run in the background so that if i close thunderbird i want it to minimize to the system-tray/notification area and inform me real time when i have a new mail. Thunderbird has a small memory footprint hence am not bothered about it sucking up my system resources. For a very long time i took what life offered and made do with opening thunderbird to check for a new mail and closing it when i am done (i hate having my task manager side of the system panel filed up with running applications). Then one day i was like heck i have had enough and decided out to find a way to get thunderbird to do exactly what i want (run in the system-tray when not needed.) i did some googling and the name firetray came up, turned out it was just want i wanted. Click the Install button, and locate/select the file you downloaded and click “OK”. After this you need to restart Thunderbird for the firetray to start working. You might also want to go through the preference of firetray to configure how you want it to behave, for example by default thunderbird does not minimize to the system-tray when you close it. You can go through the settings and configure it to your taste. Here is how i have configured mine. 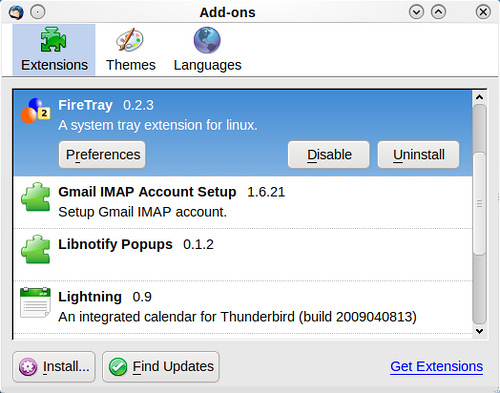 I have come to find firetray a very valuable plugin for thunderbird. Ok that is the end of my rant. Hope this helps somebody. FYI: Firetray can also be added to firefox, sunbird, seamonkey 2 and songbird, allowing to set up custom icon, minimizing to tray instead of closing, control playback using multimedia keys in songbird. Hey Buddy!, I found this information for you: "Get Thunderbird to Minimizing to Tray Instead of Closing". Here is the website link: http://bigbrovar.aoizora.org/2009/09/05/get-thunderbird-to-minimizing-to-tray-instead-of-closing/. Thank you.